The Findagrave site notes that Joseph Lord (1798-1852) was the son of Joseph Lord and Elizabeth Kimball. His spouse was Caroline Farley Lord (1797 – 1860). Thomas Franklin Waters wrote that the ancient Joseph Lord house was no longer standing. 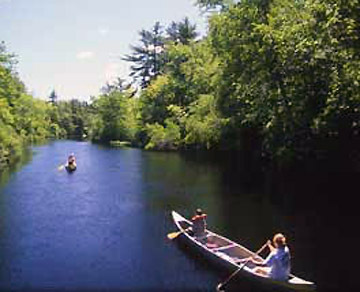 That is the approximate location of the present Thomas H. Lord house, which Waters wrote was owned at the beginning of the 20th Century by descendants of Joseph Lord. This house appears to have been built between 1814 and 1835. The builder and owner of the house at 79 High St. was probably Thomas H. Lord. 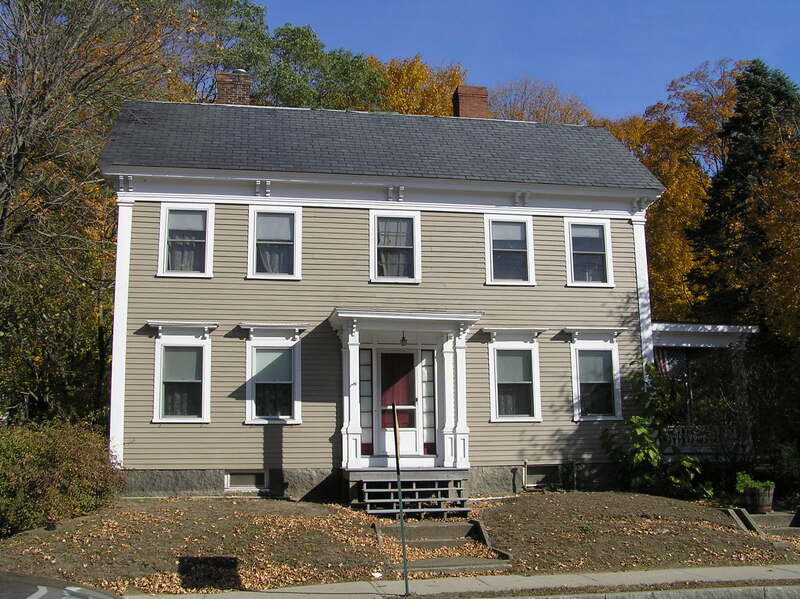 The town of Ipswich property data gives the construction date as 1814, while the Ipswich Historical Commission database indicates circa 1835. 1832 Philander map of Ipswich Village: High St. at Lords Square. The map shows “Widow J. Lord” at the location of 79 High St. (between Isaac Lord Jr. and John Kimball. 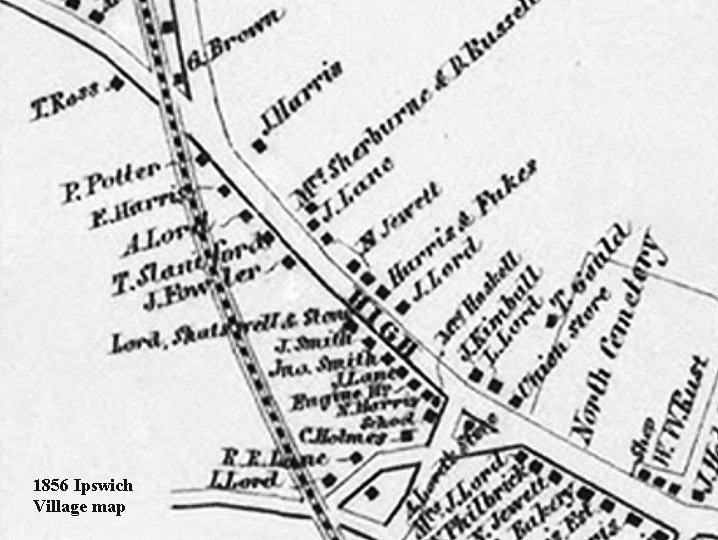 The 1856 Ipswich village map shows J. Lord at the same location. Elizabeth Kimball married Philip Lord, and after his death she sold one eighth of an acre and part of her house to John Kimball Jr., Dec. 25, 1806; the same that John Lane Jr. sold to Benjamin Fewkes, March 21, 1832. This house, now owned and occupied by Mr. Nathaniel Burnham, was built probably by Phillip Lord. 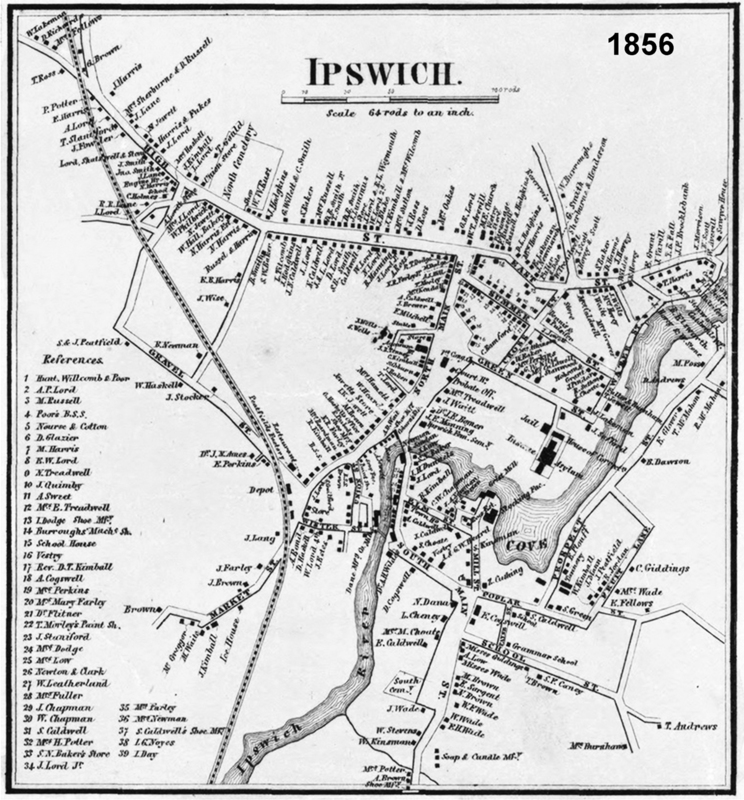 1872 Ipswich Village Map. The house owned by T. H. Lord is the site of the old Joseph Lord house. 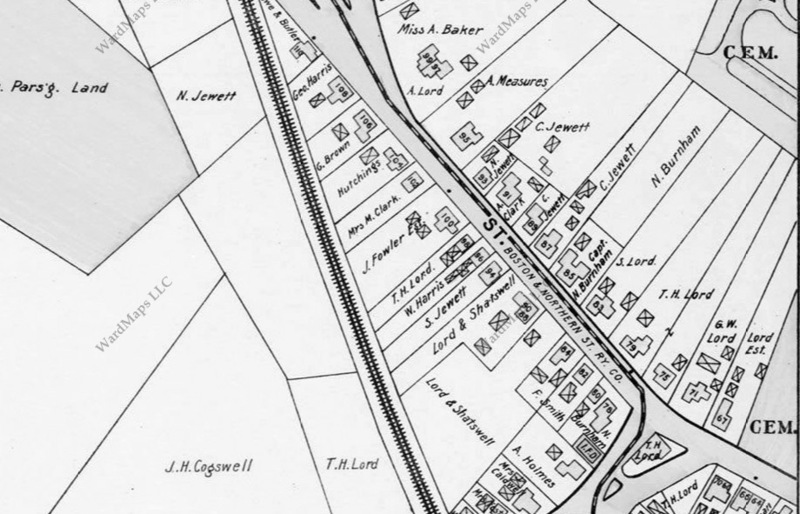 1910 Ipswich village map. 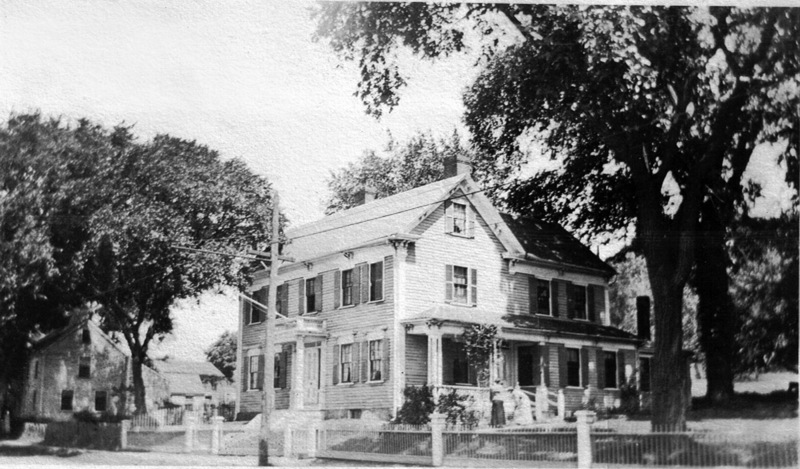 The Thomas H. Lord house is at 79 High St., and the old Joseph Lord house would have been at #81, which has no house, and still does not today. This untitled photo was taken by Ipswich photographer George Dexter. The appearance of the house matches the description of the old Joseph Lord house in the story. Trolley tracks were installed on High St. in 1896 and would have been in front of the house, but the direction of the sunlight, the intersection, and the buildings behind the house suggest a different location. 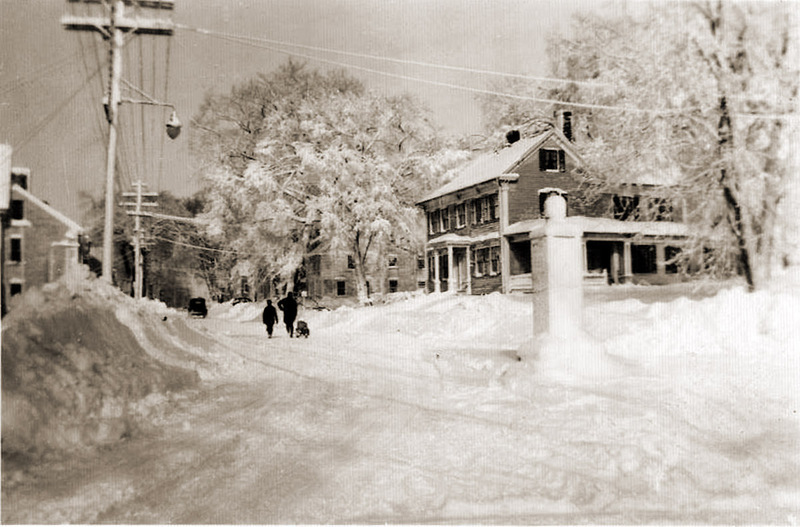 The Isaac Lord house (aka Old Jail) is in the center of this photo taken by George Dexter, circa 1900. 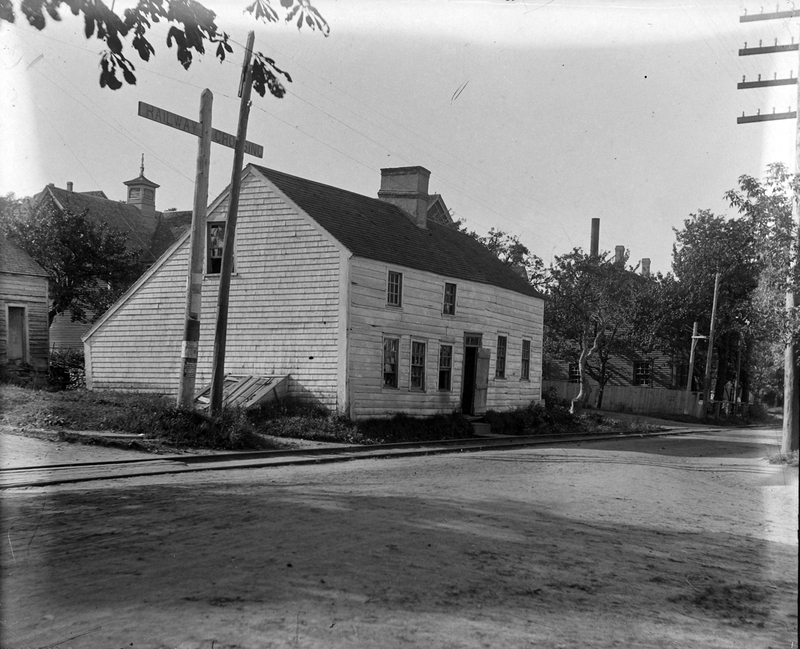 The Joseph Lord house would have been to the left in the photo but is already gone at the time of this photo.